Most of the state of Vermont’s deer wintering habitat is found in hemlock stands. Hemlock trees have a low income value here in Vermont but are high in wildlife value therefore we rarely harvest them. The state has mapped many hemlock stands as critical deer wintering sites. Any harvesting in mapped deer wintering areas needs to follow strict guidelines and is usually only done if the trees are sick or have undergone a natural disaster. Hemlock trees can live up to 400 years in this area and will continue to provide great habitat over that time. 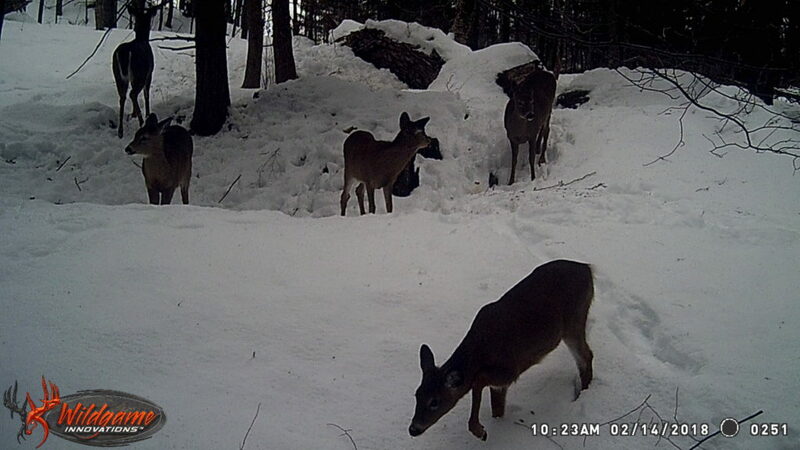 As you can see below, deer are not the only animals that use a deer wintering area. Almost all animals that are active in the winter will use these wintering areas. Pictured above: Deer are feeding under a hemlock after a porcupine clipped branches. Porcupines feed on hemlock branches, when they do, many are dropped to the ground. Deer do not pass up this opportunity for a free meal and tend to not travel far from porcupine dens. 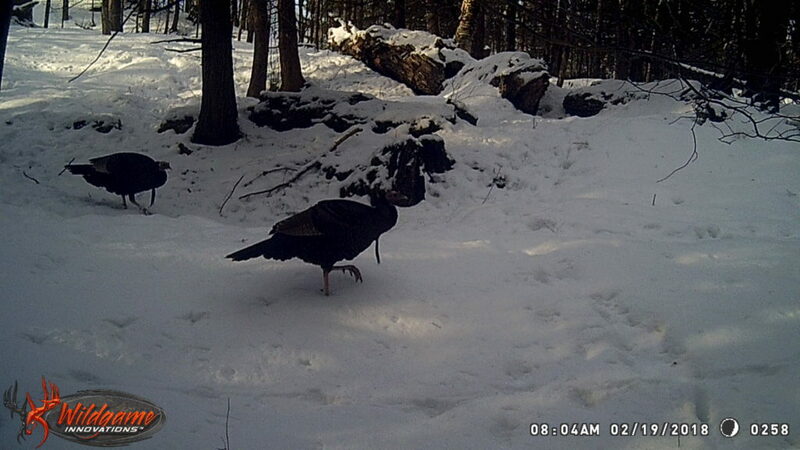 Pictured above: Two mature tom turkeys are traveling through the deer wintering area. Turkeys will take advantage of the deer trails in wintering areas where they can stay out of the deep snow. Turkeys will follow deer through the winter and capture a free meal from them. Deer will paw up and feed on nuts, ferns and minerals. Turkeys will take advantage of the shoveling job done by the deer to feed on sprouts and small seeds deer do not eat. 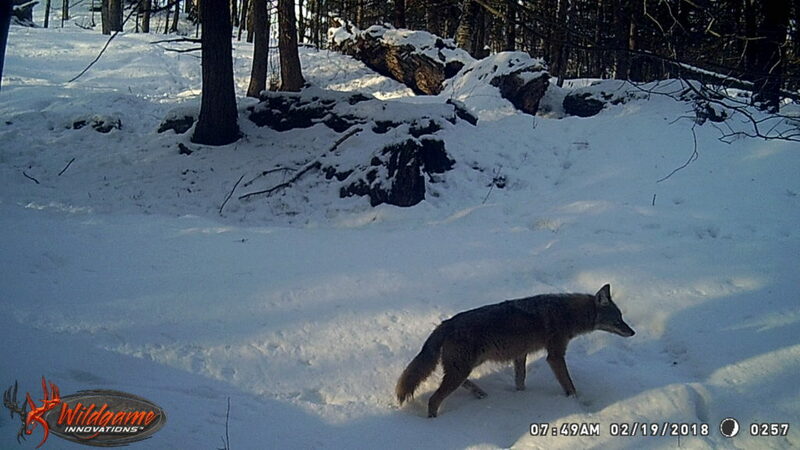 Pictured above: A coyote travels through the deer wintering area. Although coyotes are omnivores, their preferred diet is meat. They will travel through deer wintering areas looking for sick or deceased deer that may have succumbed to the rough winter environment. Deer have the advantage in deep snow and can generally escape predation. Most of the deer that are killed by coyotes in the winter occurs when a heavy, icy crust forms. Coyotes can stay on top of the crust while deer break through. If a deer is killed, many additional animals will feed on it ranging from fox, ravens, hawks to mice and squirrels that will eat the bones.